to be replaced by RLM 02 Grau, whilst the division line between the colours was moved up towards the spine, leaving the fuselage sides in RLM 65. During the interim period however, RLM 02 was in some cases used to replace RLM 71 (as can be seen on archive photographs). Furthermore, as might be expected under wartime conditions, older aircraft sometimes had their RLM 70/71/65 camouflage scheme “upgraded” at unit level by the simple expedient of raising the colour division line on the fuselage. 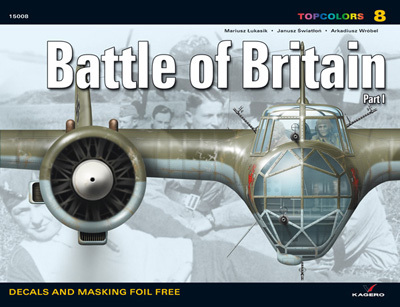 On the other hand, the Germans had noted during the Battle of France that large, light-coloured areas on an aircraft’s fuselage sides made it too conspicuous. Frequently therefore, such areas were toned down at unit level. This practice did not follow any particular scheme; rather, it reflected the whim of the individual workman and his paint spraying equipment. Generally speaking, the basic German camouflage paints – RLM 70, RLM 71, RLM 02 – were used for this purpose, singly or in various combinations. It is known that some units mixed the colours to make different shades of grey. Therefore, identifying the camouflage colours of individual aircraft is a task that can only be performed with a measure of uncertainty and speculation; all the more so because many aircraft were only partially photographed, usually from one side, and mostly in black and white. Although the British reports on captured German aircraft provide many interesting details, they tend to simplify and generalize on the issue of camouflage. or victory bars, usually painted on the rudders (of Bf 109s and Bf 110s alike). Also common was the custom of painting the propeller spinners in Staffel-specific colours. Bright-coloured rudders and engine cowlings, in turn, helped to quickly distinguish friend from foe in the heat of an air battle. Unlike the freely applied additional markings described above, the system for designating staff rank was far more precise. Combinations of chevrons and bars identified the machines flown by Geschwader and Gruppe commanders, as well as those allotted to officers of the HQ flights. Single-engined fighter units identified their individual machines by means of fuselage side numbers, which were painted in Staffel-specific colours. A notable exception were the Jabo (fighter-bomber) units formed during the course of the battle, which carried black triangles on the fuselage, and used single, block letters instead of digits to identify individual aircraft. The Luftwaffe’s twin-engined fighter units, along with its bomber units, used a four-character code (known as Verbandskennzeichen – not to be confused with Stammkennzeichen, factory-applied letter codes), painted on both sides of the fuselage, to identify individual aircraft. The first two letters (or a letter and a digit) denoted a Geschwader, and were painted in black ahead of the fuselage cross. The third one, painted directly aft of the cross, was an individual aircraft letter. It was painted in the colour assigned to a particular Staffel. This letter was often repeated on the wing undersurfaces outboard of the crosses (usually in black), and sometimes also on the upper surface of the wings, outboard of the crosses, in black or in the colour of the individual aircraft letter. The fourth and last character, painted in black on the fuselage, identified which Staffel the aircraft belonged to. The following table shows how the system worked. Apart from the aforementioned markings, additional graphic elements were sometimes used to help crews identify aircraft of their own unit while forming up. Good examples of such markings are the white rectangles, painted singly or in groups, on the tails and wing upper surfaces of some Ju 88s and He 111s. Another example of this type of marking can be seen in the narrow, white fuselage bands, painted directly aft of the wing trailing edge on some Do 17s. The opulence and variety of the camouflage and markings found on aircraft participating in the Battle of Britain make it a most intriguing subject to study and research. Fortunately for aviation enthusiasts, and modellers in particular, there are many photographs from the period. The authors of this book have done their best to analyse and verify available documentation to produce the following colour plates and descriptions.